Electric grills have a reputation for not being able to bring the kind of heat you can get with a traditional gas grill, while also lacking the flavor of charcoal. This bad rap, left over from small scale kitchen appliances, don’t hold a lot of water with the Kenyon B70400 Texan All Seasons Built-In Electric Grill. The 1,500 Watt, 240 Volt electric grill is capable of very high heat. Indeed, Kenyon rates the Texan to be capable of reaching up to 600 degrees in just over 10-minutes. It is designed to be used as a built-in electric grill, which requires at least a 30-inch cabinet or cart. 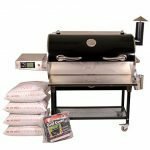 The Kenyon B70400 Texan is UL approved to be used as an indoor/outdoor electric grill. It is rated to be safe for use in kitchens, and condos. It has an automatic timer and a safety shutoff. It’s also worth noting that the Texan is made from marine grade stainless steel, which means you can install it in your boat without having to worry about saltwater corrosion. At the same time, it can also be installed into an outdoor counter to give you a patio or deck kitchen space. The grill grates are specially coated with a non-stick material, which helps with cleanup. It also has a large drip pan that can either collect runoff material and rendered fat. If you prefer it can also be used to produce steam to keep meat and vegetables from drying out. Made from marine grade stainless steel, the Kenyon B70400 Texan shines with quality. The 1,500 Watt, 240 Volt electric element provides superior heating that you rarely find with an electric grill. It’s waterproof controls and components mean you can install it in places that you normally can’t use a traditional gas or charcoal grill. When it comes to assembly, the Kenyon B70400 Texan comes down to where and how you want to install it. It is approved by Underwriters Laboratories to be safe enough for outdoor kitchens, indoor kitchens, boat kitchens, condos and more. The ability to generate 1,500 watts from the electric elements means that the Kenyon B70400 Texan is truly capable of producing the kind of sear you get from traditional grills. The waterproof controls are a nice touch when you want to grill outdoors or on your boat. It also has a dual heat zone control. This allows you to set up one side for say medium-low heat, to saute or sweat vegetables. Then you can set up the other side for high heat, to sear off an inside skirt steak or some chicken tenderloins. This allows you the rare treat of being able to produce restaurant quality fajitas with an electric grill. 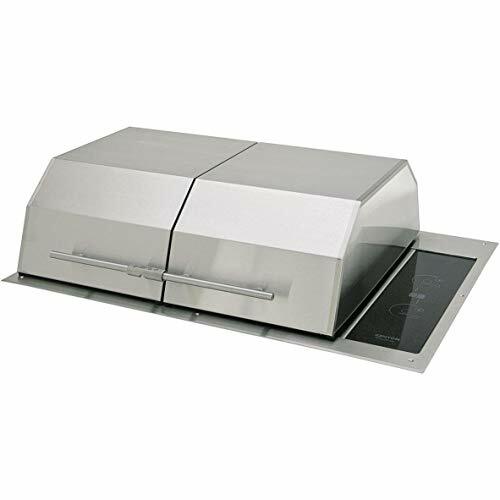 The Kenyon B70400 Texan also has a split lid, so you can close one side to trap in steam and heat while letting the other side grill directly. The drip pan is a nice feature to make for easier cleanup. Yet Kenyon goes a step further, in designing the B70400 Texan’s drip pan to also double as a steamer tray. This means you can add some extra marinade with water or a glass of wine to add steam to potentially dry cuts of meat or vegetables that might be prone to burning. In the case of fresh fish, you can put some lemon slices, and julienned red onions in the drip tray, along with half a cup of water to steam the fillets. This is a nice touch if you say want to grill up your fresh catch right on the boat. Both areas combined provide you with a grand total of 310 square inches of grill grate space. This is enough to grill four to six hamburger patties or say 4 ribeye steaks. 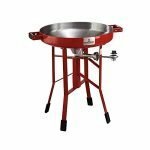 It also seems as if it was specifically designed to handle a fresh caught red snapper. 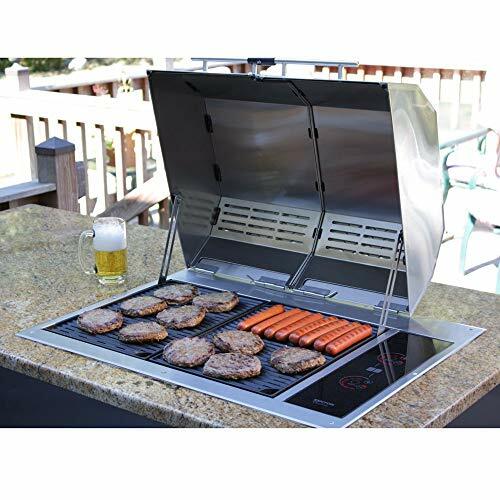 The split hood and dual heating zones are a nice touch for times when you want to grill two separate things that need different temperatures of heat characteristics. The waterproof controls and stainless steel construction, along with the automatic timer and safety shutoff make it possible to safely integrated this electric grill into boat’s kitchen or countertop. This allows you to have the galley of your dreams or an outdoor deck kitchen that’s sure to impress your guests. 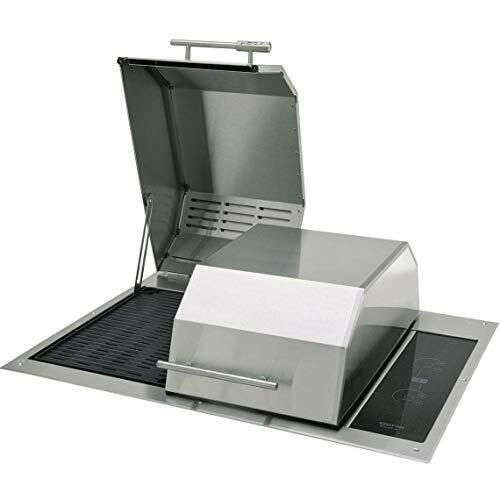 The non-stick coating on the grill grates and the large drip pan make the Kenyon B70400 Texan very easily to clean. Just be careful not to get too aggressive when you scrape down the grill grates, as you could scrape the non-stick coating. The Kenyon B70400 Texan comes with a three-year product replacement warranty, assuming proper use and installation. If you want to incorporate a grill into your boat’s galley or design an outdoor kitchen with the convenience of home, you might feel forced toward a gas grill. Thankfully the Kenyon B70400 Texan was designed with safety and effectiveness in mind. It’s hard to look past the fact that UL has approved it for indoor and outdoor use. Not to mention the fact that it has other integrated safety features. The dual heat zone and a split hood is also a really nice touch. 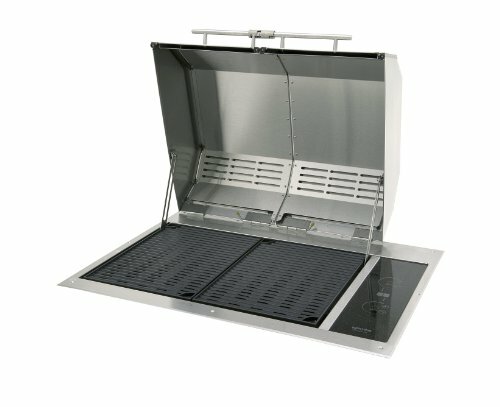 Just keep in mind that this is an electric grill that is meant to be installed directly into a counter, kitchen compartment or a cart. If you are a first-rate do-it-yourself kind of person, then you might be tempted to install it in the desired space. Just make sure that you are well aware of any safety codes that apply. This includes double checking with your insurance provider to make sure that the Kenyon B70400 Texan won’t void any coverage in your policy. Quality Marine Grade Grill For Boat Or Outdoor Kitchen!